“On May 20th, 2009, Drew Olanoff was diagnosed with cancer: Hodgkins Lymphoma. “Ever since that day, Drew has blamed everything on his cancer. Losing his keys, misplacing his wallet, Twitter being slow, the Phillies losing, etc. “Why? Because you have to beat up on Cancer to win… and you can help out. It takes a strong guy to take his cancer diagnosis and turn it into a viral internet phenomenon. 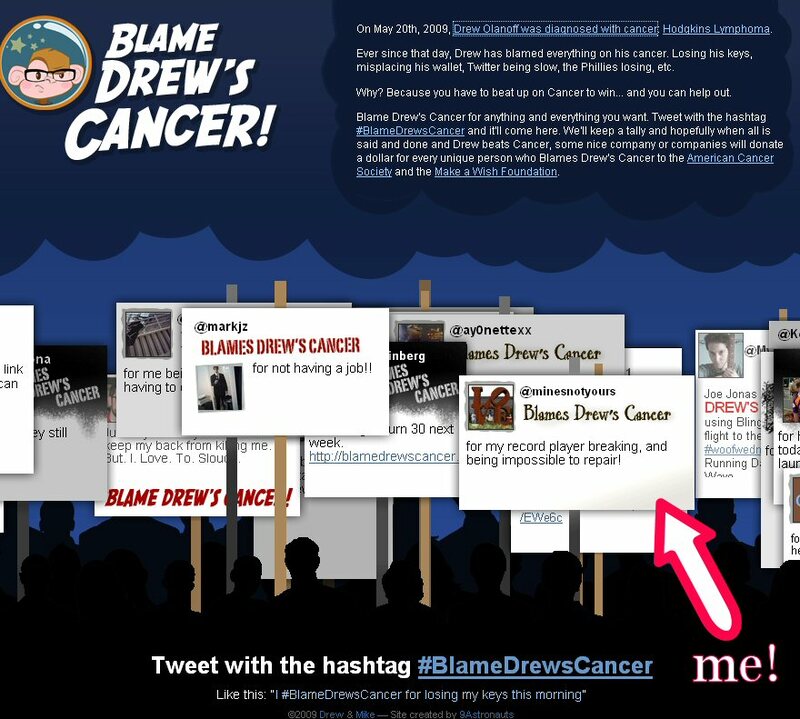 People by the thousands are using twitter to blame Drew’s cancer for their problems, and we can see them all at http://blamedrewscancer.com. They’re hoping that some nice companies will donate a dollar for every person that blames something on Drew’s cancer to the American Cancer Society or the Make a Wish Foundation. Sounds like a bit of fun and potentially a good cause…. Marcia blames Drew’s cancer for the squirrels that keep attacking our garden, and I blame Drew’s cancer for every software bug I’ve fixed since May 20th. Thankfully, Hodgkins Lymphoma is one of the most curable kinds of cancer, with a 90%+ remission rate. Still, Drew will have a tough road ahead, and we wish him the best. So if you use Twitter, go and #BlameDrewsCancer for something. Then watch http://blamedrewscancer.com for yours to pop up (mine took about 10 minutes to show). I never did see mine pop up! I don’t twitter, but I may just have to blame Drew’s cancer for some stuff anyway! Every little bit helps, right? 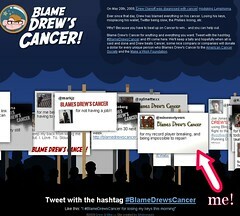 Twice yesterday I Blamed Drew’s Cancer, and I never got to see mine pop up! This morning however I tried it again, and it was less than 2 minutes and it appeared, that was fast!